This pair of CDs, newly released by the California-based Cold Blue label, challenges assumptions about what the phrase "listening to music" is all about. This is what we have come to expect from this label, which specializes in the more abstract or ambient forms of modern "classical" music, and seems to favor mellowness and atmosphere over angst and academic theory. Other composers who have made their home on Cold Blue CDs include Chaz Smith, Michael Byron, Daniel Lentz, Rick Cox, and Jim Fox. Fahres was born in Bamberg, Germany in 1951 and studied electronic music at the Institute of Sonology in Utrecht. His composition teachers were Louis Andriessen and Ton de Leeuw. For more than 20 years he was the director of the CEM Studios – devoted to electronic music – and, between 1979 and 1982, director of the European Minimal Music Project. This is the fifth CD devoted completely to his music – his first for Cold Blue. The three works on this CD are portraits of three different regions of the world – electro-acoustic landscapes, if you will. At a little more than a half-hour, the longest of the three is The Tubes, which (I assume) refers to the tube-like rock formations created as lava spilled into the ocean surrounding El Hierro, the most western of the Canary Islands. The Tubes, pervaded by the sound of the ocean itself, is a figurative expedition in sound around El Hierro. Jon Hassell's signature breathy trumpet and Mark Atkins's didgeridoo, the Australian wind instrument developed by the aboriginal peoples of the northern part of that continent, both are, in essence, tubes, and so they serve as atmospheric metaphors for the lava formations on El Hierro. Hearing this work, one knows how the fish feel, never having to come up for air. Very nice. 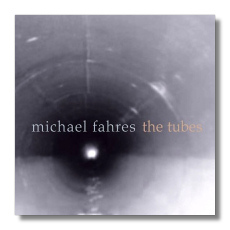 This version of The Tubes (from 2003) was mixed by Michael Hoenig, formerly of Tangerine Dream. Sevan (2000/03) includes the haunting voice of Armenian singer Parik Nazarian, vocalizing in large empty pipes that were discarded around the shores of that eponymous lake after the Soviet Union relinquished control over Armenia. The work also includes the processed singing of an Armenian choir, and the sound of stone cutting and polishing. In this particular work, Fahres's techniques and electroacoustic landscaping are reminiscent of earlier compositions by Paul Dresher and Ingram Marshall. Coimbra 4, Music Theatre is based on a "sound spectacle" that occurred in the Portuguese city of Coimbra in 2003. Together, Portuguese composer Carlos Alberto Augusto and Canadian composer R. Murray Schaefer mobilized some 1700 musicians or sound-makers for a one-of-a-kind event, which was called "Coimbra Vibra!" Fahres took sound documents from that event, and made his own work out of them, innocent of any first-hand experience of the event itself. "Coimbra's 'geophony," writes Fahres, "was projected onto a non-location-specific sound map. It no longer had anything to with Portugal. If it has any geographic connection, it is with my composing environment, Utrecht." Coimbra 4, Music Theatre is a sound-collage of events both large and small. It marks Fahres's skill as a composer that the results sound neither haphazard nor lacking in context, but robust and inevitable, and quite viable outside of the milieu that produced the source materials. Born Charles Martin in 1945 (or 1947), the shamanistic Charlemagne Palestine is a Minimalist composer-performer who has kept a singularly fixed eye on his artistic interests throughout his career. There has been no compromise, and, as result, little fame. Palestine has spent much of his career exploring the implications of drones, both electronic and acoustic, and his concerts generally retain a visual or "performance art" element as well. (For example, teddy bears often are arrayed on and around the pianos on which he performs.) Described simply, Palestine's music comes from the inherent minute variations and overtones associated with sustained tones, and their less than "perfect" interactions with each other… what are known as "beating" tones, for example. The music lives on the border of scientifically explicable wave physics and ambiguous, inexplicable mysticism. 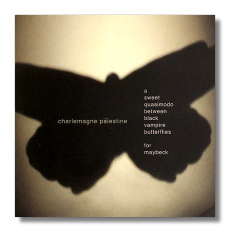 A Sweet Quasimodo Between Black Vampire Butterflies for Maybeck qualifies as one of the best titles I've heard all year, and of course it is not explained. (Nor should it be.) This is a live performance from the Maybeck Studio in Berkeley, California dating from January 7, 2006. In the absence of booklet notes (and oh, for a DVD of this! ), it is difficult to know precisely what is going on here, but I gather that in this work, Palestine is sitting in front of two Yamaha pianos. During the work's initial moments, he contents himself with a single note struck repeatedly (alternating between the two pianos? ), varying the speed of the repetition and the intensity of his touch. As time goes on, he varies the texture by adding or taking away notes, all the while building up gargantuan sonorities through repetition, aided by the sustaining pedals. The composer calls this technique, which creates a tremolo effect, "strumming." Compared to Palestine's rarefied Schlingen-Blängen, a work for organ (New World 80578-2), A Sweet Quasimodo is in at least one way confusingly "maximalist," in that so many different notes are used. The composer's sometimes hammering insistence on them keeps the music firmly in the camp of old-school Minimalism, however, and the accumulating jet engine-like sonorities, which are both shimmering and monolithic, are inexplicably gorgeous. On this CD, Palestine introduces the work, after a fashion, with words and with a little prelude played on the rim of a brandy snifter, and accompanied by his cracked falsetto "singing," if one can call it that. (Or is it his singing that is accompanying the brandy snifter?) The singing returns at the end. "Normally I would do an ending, but this is just the beginning," he explains. One feels that his music could go on forever, and that his performances simply take chunks, large or small, out of that "foreverness," if you will.